I bet you all know what day today is? It is mason jar day! One of my favorite days of the month. I absolutely love to decorate and create using mason jars. Today I am showing you a painting technique. We will be marbling with acrylic paint. How fun is that? Keep scrolling to see the awesome results. 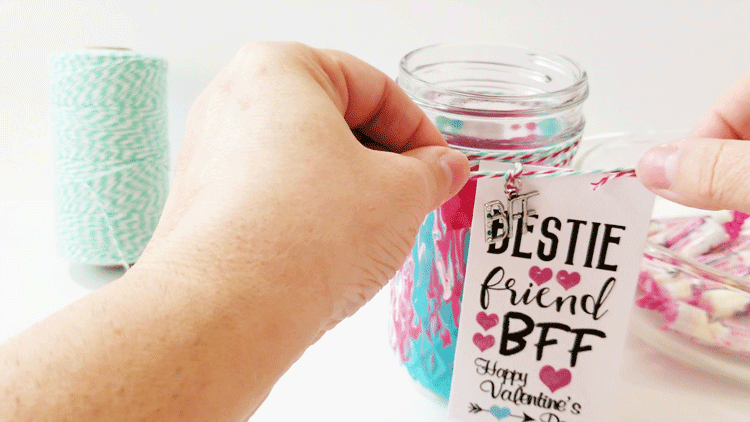 Mason jar day wouldn’t be the same without friends. 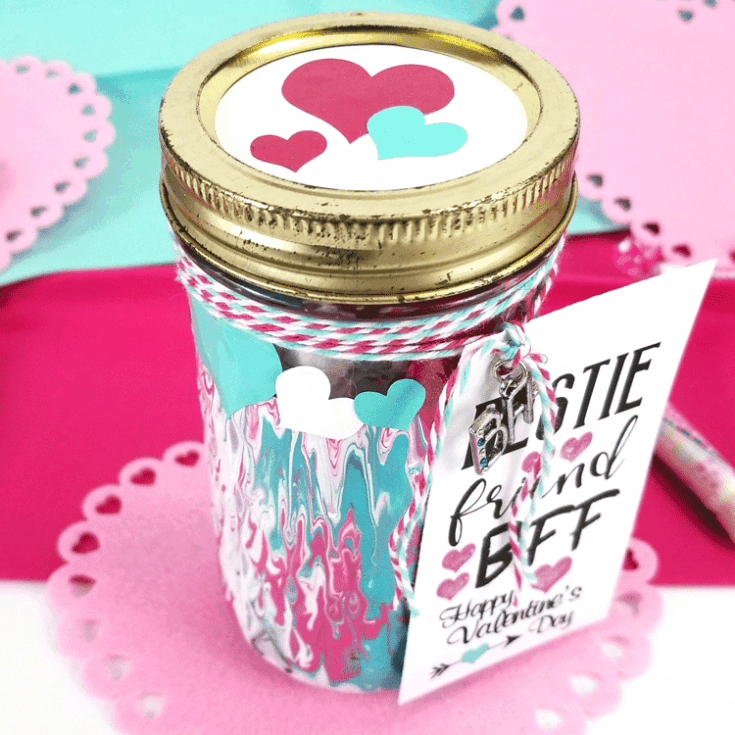 Be sure to check out the Valentine mason jar ideas from my bloggy friends. There is a collage photo of all of the awesome ideas and links to their projects at the end of this post. I haven’t dipped into a good painting technique in a while so this was a nice project and I really enjoyed it. We always have acrylic paints on hand but the marbling medium was a product I hadn’t used before. I did not try this marbling technique without the medium but I wonder if it would look as good? Either way, give it a try and let me know what you think. 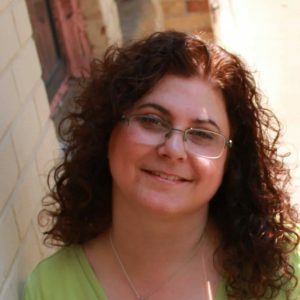 Be sure to subscribe to MY YOU TUBE CHANNEL! If you like to read the step-by-step tutorial and see a picture of each step keep on reading. The entire written tutorial is listed below. 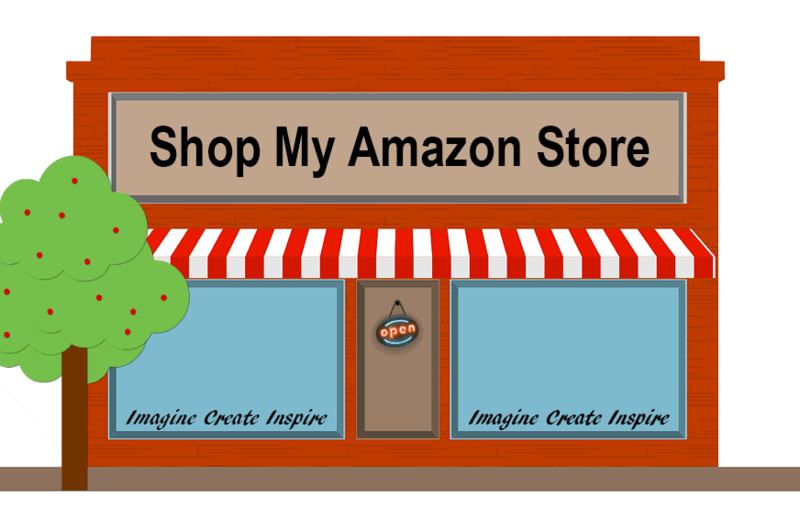 I have included some crafty affiliate links for your convenience! You can read my full disclosure here! 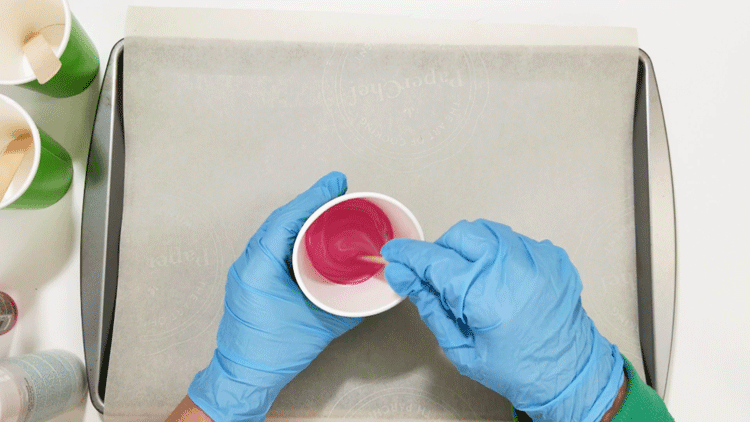 Create a unique marble effect using this marbling paint technique with acrylic paint and marbling medium. The additional time listed below is to let the paint dry overnight. Place upside down onto something that allows the jar to be "hang" above the work surface so it can drip and dry overnight. I ended up placing mine on top of one of a paper cup. 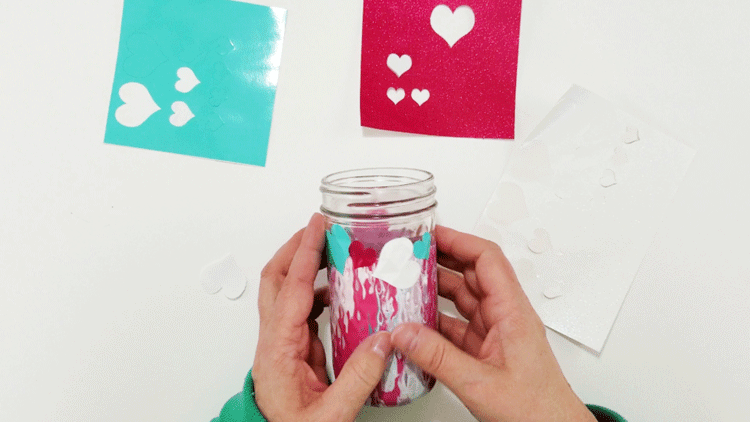 Place the hearts over the "line" of paint all the way around the jar. I tilted and varied the heart sizes and alternated the colors. 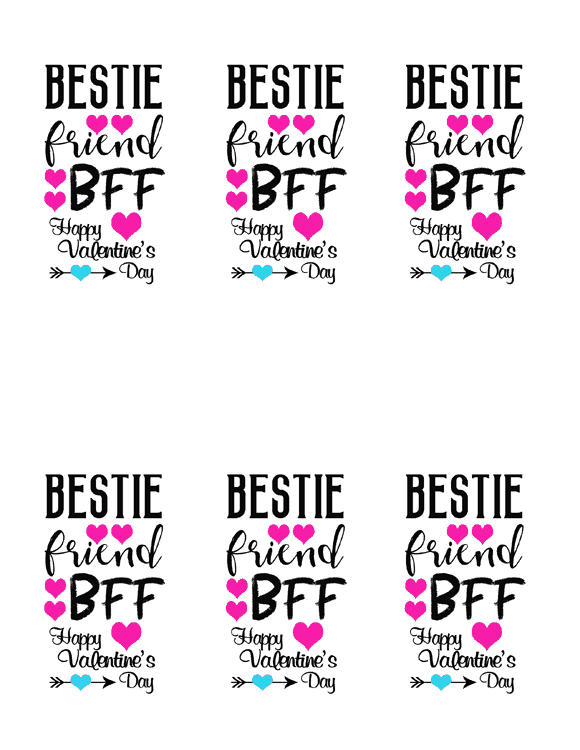 Print the tags and cut one out. It should be 2.25" x 4". Punch a hole at the top. I punched the hole to one side so the tag would hang at an angle. 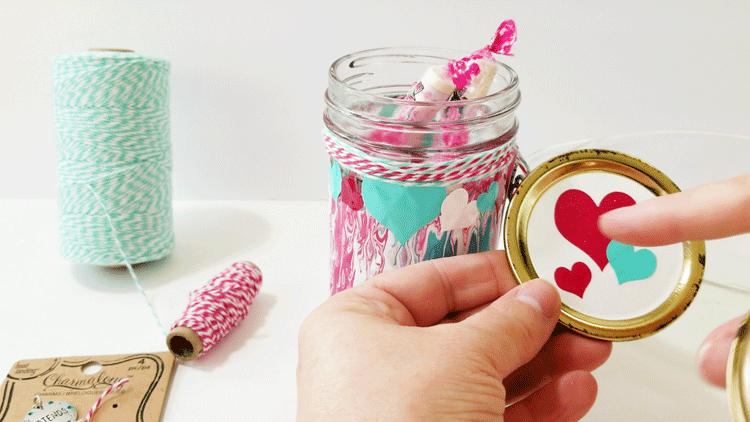 Add the circle and a few hearts to the top of the jar lid. 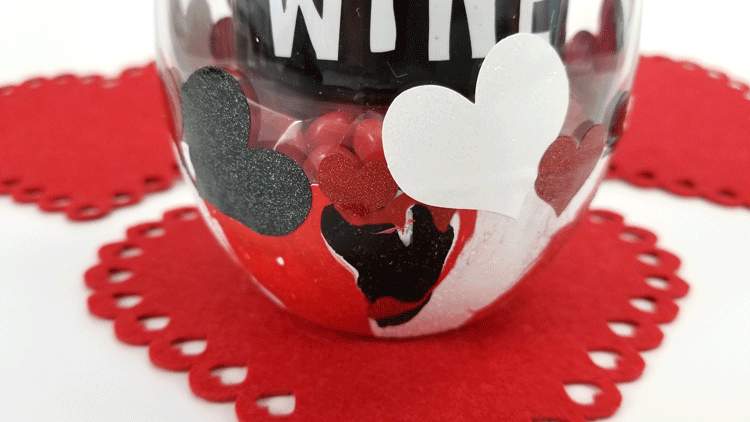 Fill the jar with candy and place the lid on the jar. 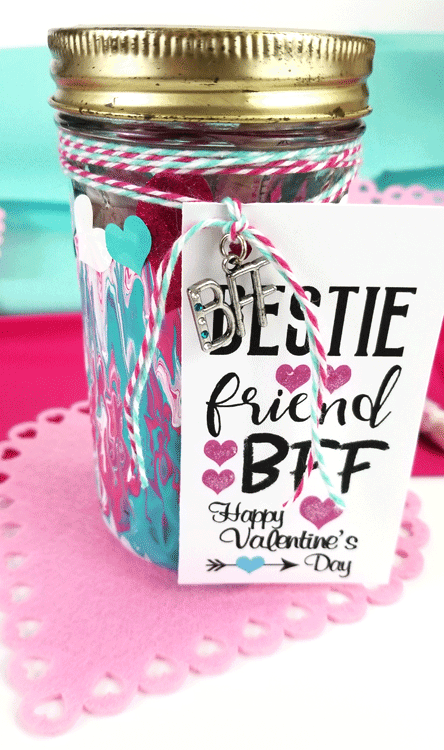 Give to your bestie and watch their eyes light up!! 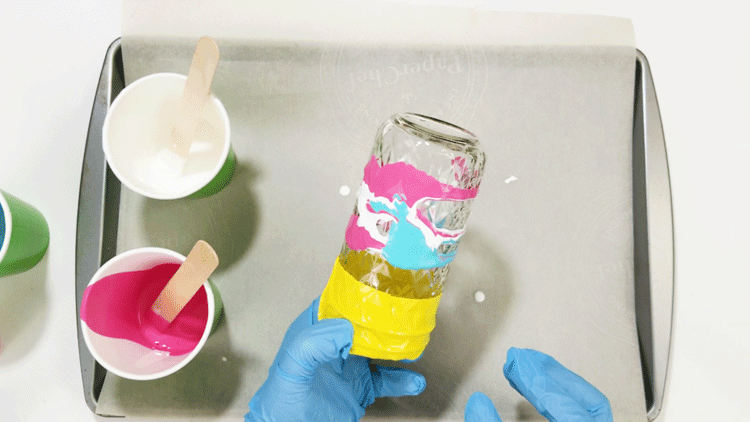 Grab some paper cups or something to mix each color of paint and a stir stick. 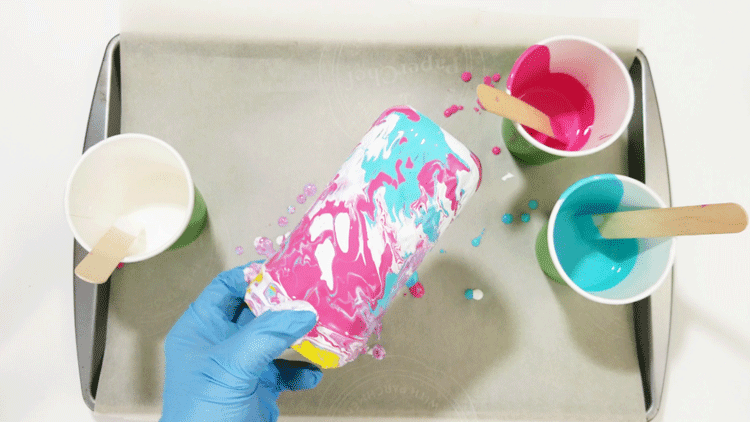 Pour 1 part paint to 2 parts marbling medium in a cup and stir them slowly until they are completely mixed. 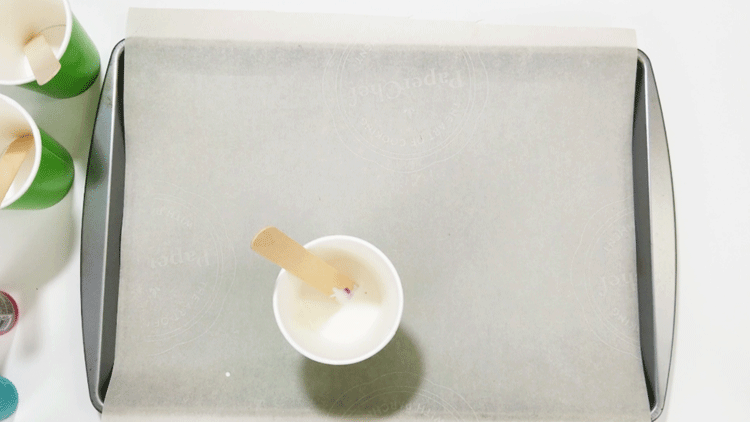 Measuring exact amounts is not necessary…I just eye-balled the portions of paint and medium and it all worked fine. I used some scrap vinyl for this. Contact paper will also work but I know that the vinyl is very sticky and I thought it would help to keep the bleed to a minimum. This is the fun, messy part. 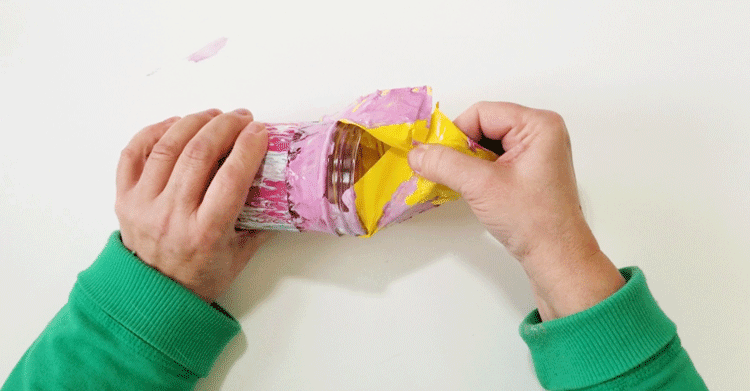 Start adding the paint to the jar by pouring small amounts. 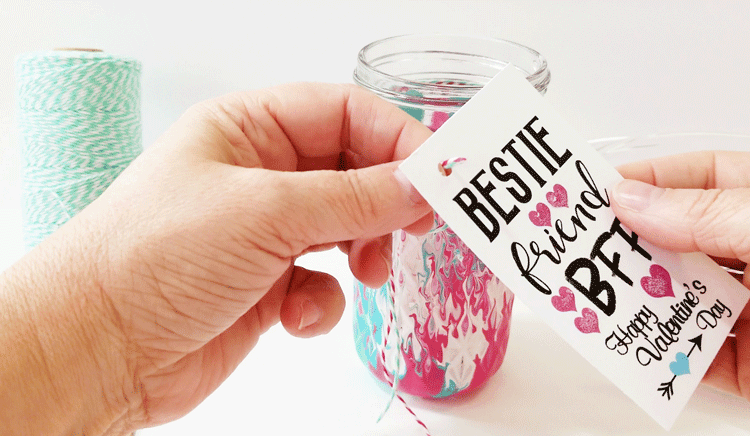 Vary the colors in different places on the jar and let it marble into each other. Keep adding the paint, alternating colors and adding where the glass is still showing. Isn’t it looking pretty? I thought so. 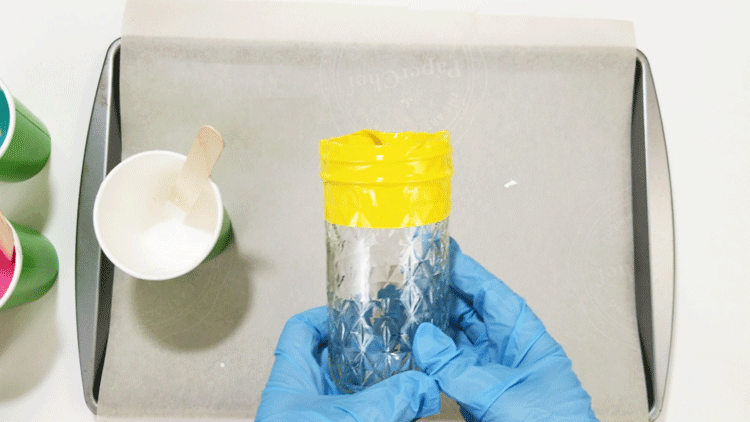 When the jar is covered, place it upside down onto a cup or something so it can drip and dry over night. A razor blade worked well to create a cut in the paint next to the vinyl mask. When I pulled the mask away the dry paint stayed in place. But there was some wet paint that had bled under the masking. A dry paper towel worked well to get the majority of the paint off the glass then a damp paper towel finished off the little bits that were still left over. 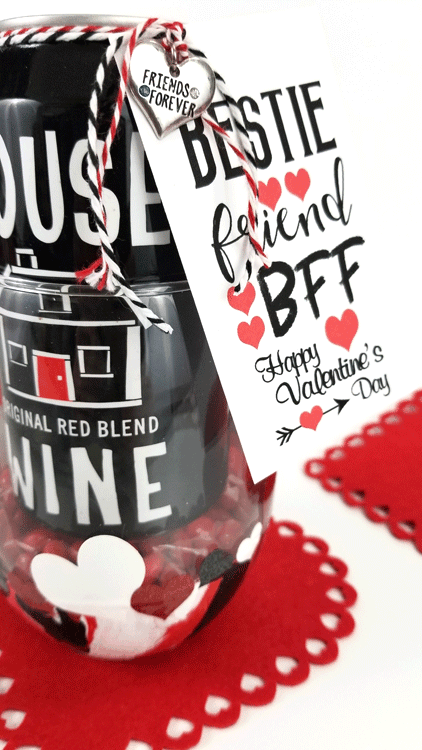 The vinyl hearts just add a little more “Valentine” to this BFF gift. You will want some varying sizes and colors. 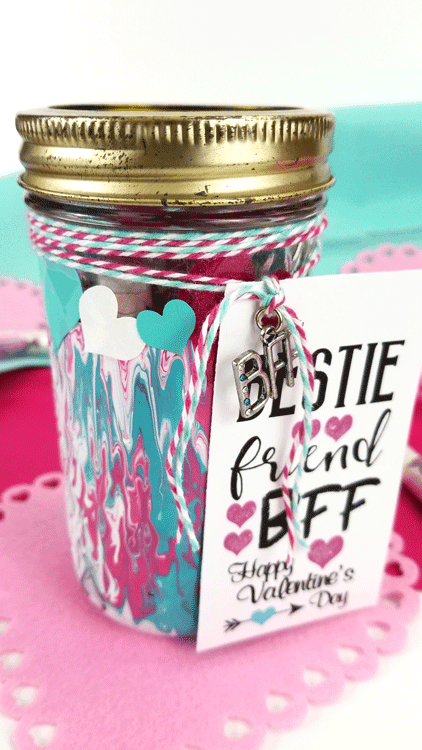 I used three sizes of hearts and three colors for my jar. 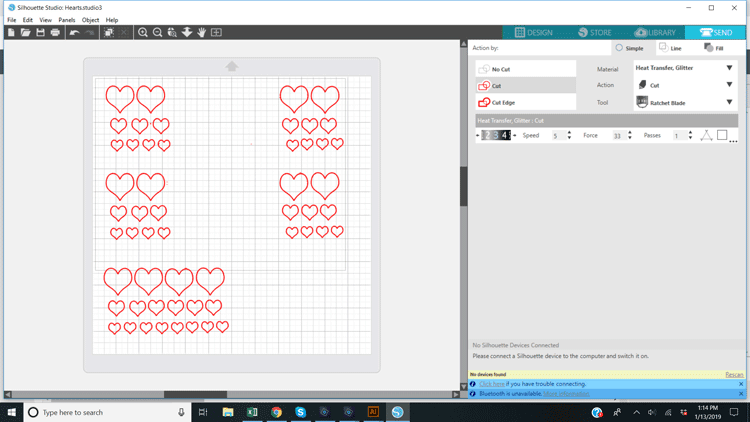 Here is a screen shot of my Silhouette design space. As you can see I have five different areas for hearts. 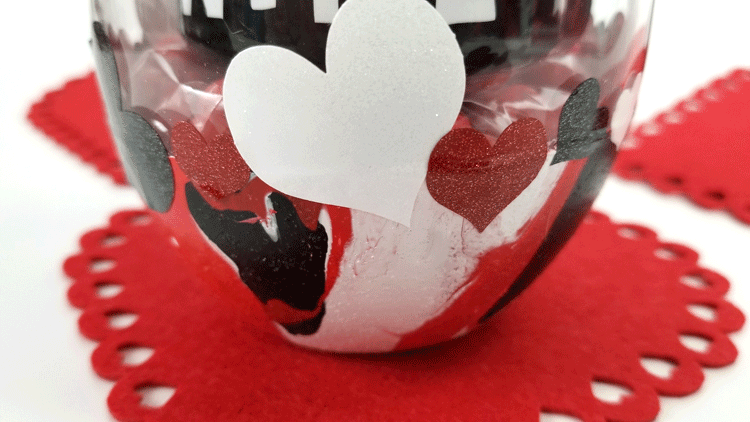 I was also decorating a stemless wine glass using the same marbling paint technique so I cut some black and red hearts along with the teal, pink and white hearts. The white hearts are the bottom grouping. I needed white for both projects. This is a great way to cut all of the colors at the same time. It save a bunch of time! 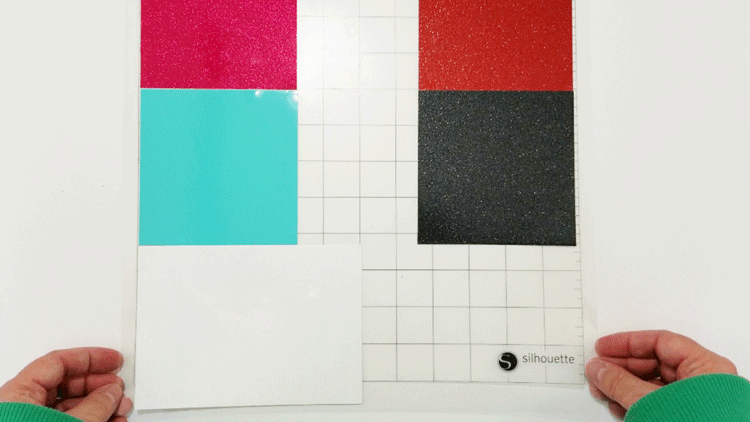 When you cut multiple colors of vinyl you just need to separate the cuts by color on the screen as I have done. Then you can place your different vinyl colors on the mat accordingly. 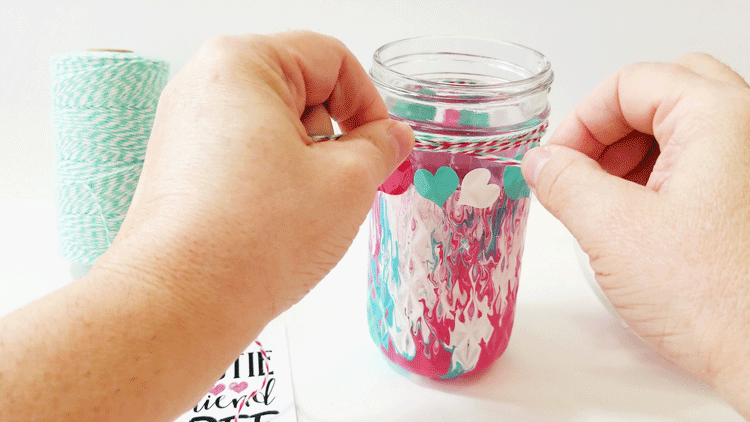 When you add the hearts to the jar you can place them anywhere you like. I wanted mine to cover the harsh line from the paint. So I alternated sizes and colors and placed them at different angles all the way around. 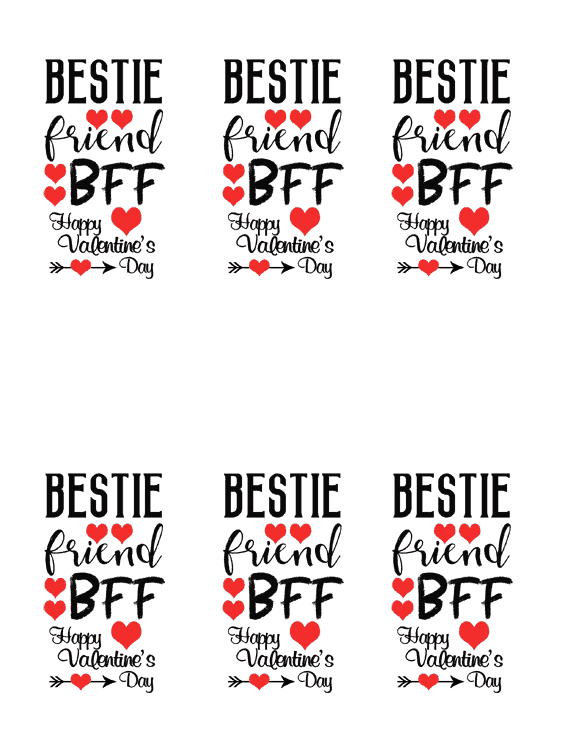 I created tags for this Valentine jar and they are free for you to download and print. Please use for personal use only. Just click on the link below to grab the download. I created two versions. 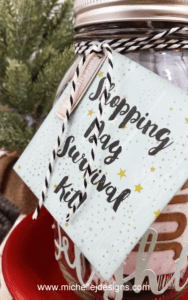 One is the pink and teal version I used on the mason jar and the other is the black and red version I used on the stemless wine glass gift. I have included pics of this at the end of the post! There are six on an 8.5 x 11 sheet as shown below. 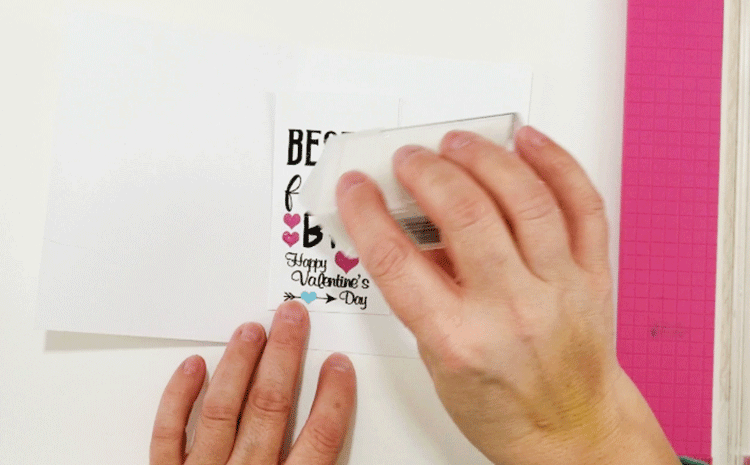 Use a paper trimmer to trim the tag to size. It should be 2.25″ wide and 4″ long then punch a hole in the tag. 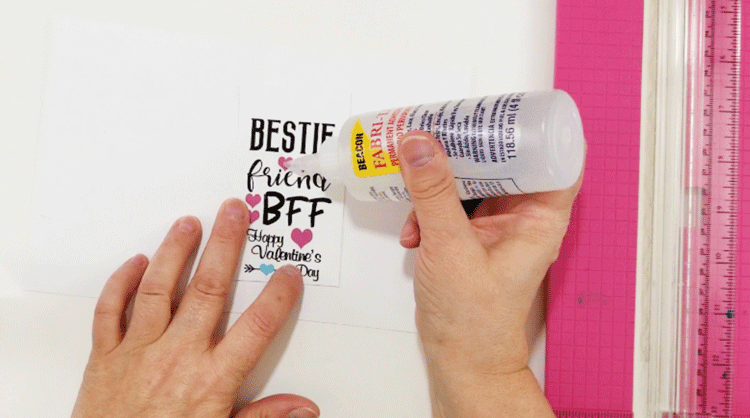 Add liquid glue to the pink hearts then sprinkle on glitter for some sparkle. Wrap two stands of bakers twine around the top of the mason jar and tie the first part of a knot. Slip the tag onto the two strings on the right side then finish the knot. Grab one strand of baker’s twine and slip the charm on then grab all of the twine pieces and tie one more knot to secure the charm. I wanted a little bit of color and decor on the lid. I cut a piece of the white glitter vinyl in a circle to the size of my lid then added some of the leftover hearts. You can see that I used Smarties as my candy of choice. Once the lid is done and the candy is in your are done! I just love it. The marbling turned out so nice and the whole Valentine gift comes together. Here are the photos of the wine glass I made at the same time using all of the same techniques and steps from above. 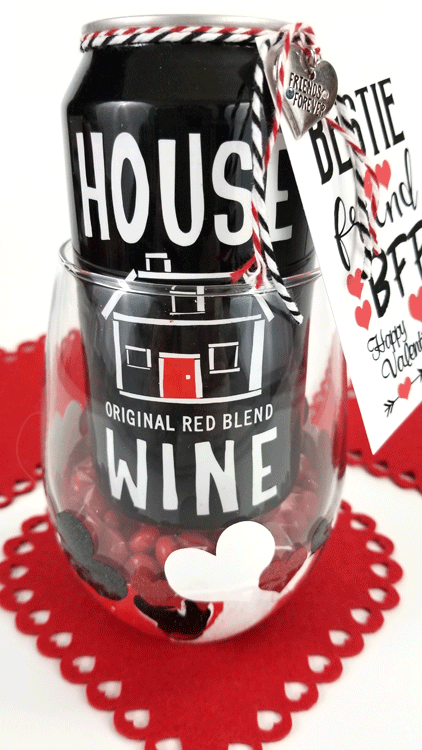 Cinnamon hearts were placed in a cellophane bag and placed under the can of wine. This one is just as fun…IMO! The marbling turned out really pretty too. I hope you liked this project and will give it a try. You can watch my Step-by-step video here! Don’t forget to visit these blogs to see their great ideas too. 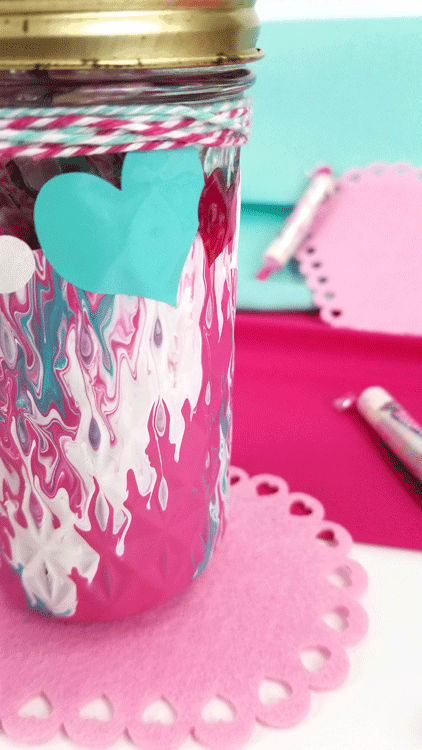 Another creative use of a jar, Michelle! And the wine glass, as well. Very pretty! Thank you Nancy! I LOVE the mason jar and wine glass projects. I am glad you like them. That wine glass was so fun and did you know that wine comes in a can? I had no idea! I have never tried marbling before, but I will soon! 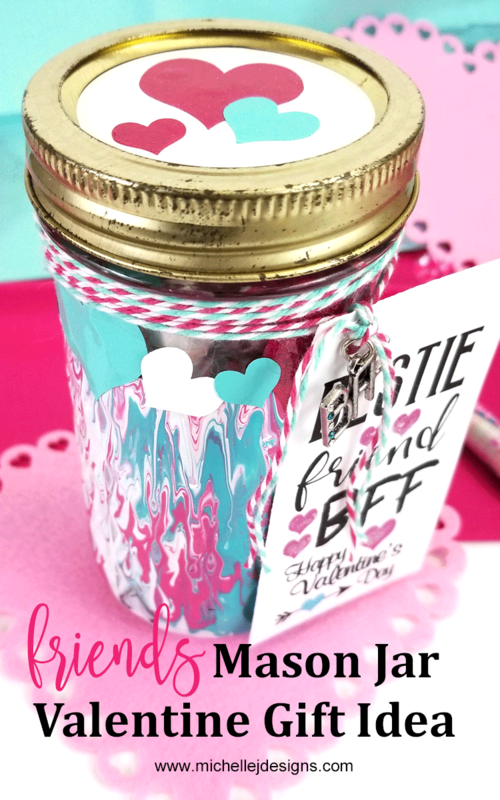 I love how the marbling looks on the textured jar! 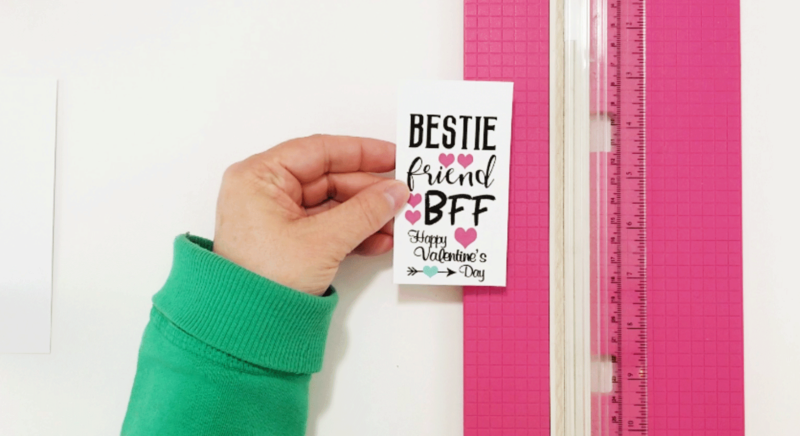 What a fun Valentine project! Thank you Maureen. You should definitely try it. It was a lot of fun even though it was a but messy. OMGosh I need to try this I have so many ideas right now. What a cool technique. 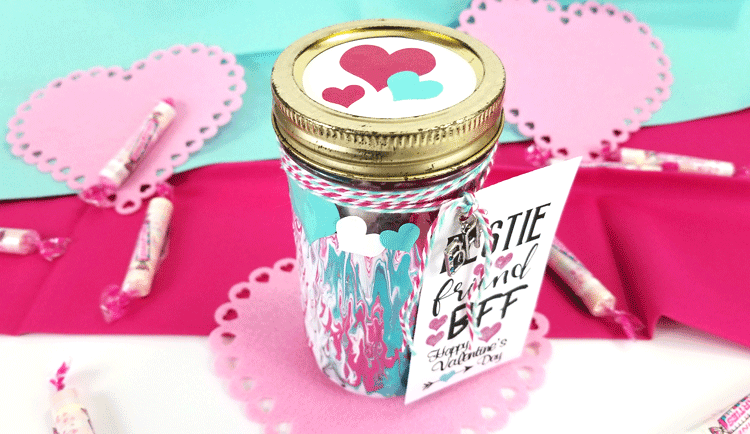 You have so many cute elements on this jar! I love the marbling technique and your video is really helpful. Thanks! Thank you Sarah. I am glad the video was helpful and thank for watching it!! This was a really fun technique. 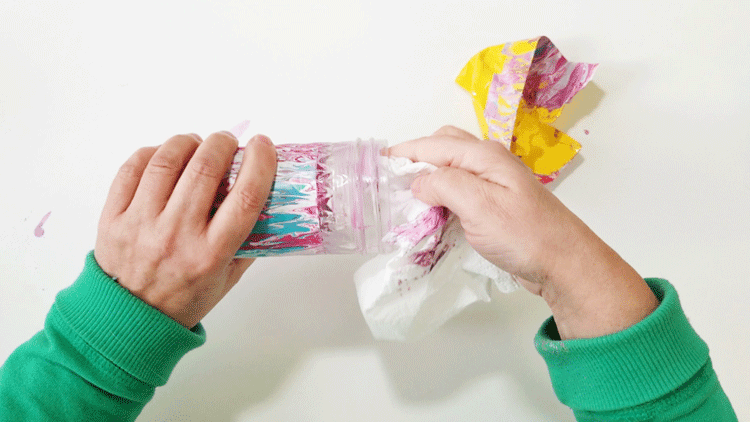 This marbling technique is so cool! I loved your video too! It really helps to see the process. Thanks for motivating me! Hi Michelle. Thanks. I had fun and I am glad you were inspired. I hope you try this. You will like it.